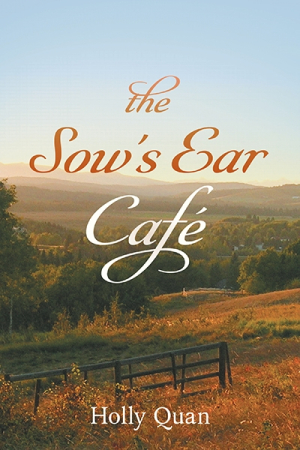 The Sow’s Ear Cafe is an avidly inspiring and comforting story. Down-on-her-luck Lucie swaps a Vancouver office job for “tumbleweeds and cowboys”—and finds herself along the way—in Holly Quan’s inspirational novel The Sow’s Ear Café. As the book begins, Lucie is working up the courage to end her toxic relationship with übermacho Brad. Over the next few weeks, she is fired from her job, falls out with most of her friends, and is evicted from her apartment. Thankfully, Lucie’s no-nonsense friend Judith lets her borrow an old car and tells her to go on vacation, as long as she comes back with an improved attitude. Lucie is thirty-nine and needs to grow up. Lucie drives across western Canada, staying in motels and B&Bs until, by sheer serendipity, the car breaks down in the tiny town of Sweetgrass, where a sort-of-famous café, The Sow’s Ear, is hiring. Over the next few months, Lucie adjusts to a new lifestyle out in the country, leaving “her previous life … like a half-read book left face down beyond the jagged western horizon.” In Sweetgrass, she rides horses and serves regulars at the cafe; in Vancouver, she drank wine and gossiped with her friends about work and relationship drama. Surprising both herself and Judith, Lucie stays much longer than she had intended, finishing her journey with more than the change in attitude she wanted at the start. The beautiful ranch and busy restaurant settings come alive in these pages. The daily life of coffee and biscotti at sunrise and galloping horses through the fields elicits a serene country atmosphere. The characters in Sweetgrass are true products of their environment, juxtaposed usefully to the amalgamation of personalities Lucie was used to in the big city. While many characters may come across as small-town folk stereotypes, they help Lucie grow and add depth to the setting. A restaurant owner and his kindly European wife; a chef, Ray, who becomes a new love interest; and friends Amanda and Keith are all familiar, friendly archetypes who add an emotional layer to Lucie’s Sweetgrass journey. As the story moves seamlessly from scene to scene and through the lovingly described seasons, the pace remains stable, albeit a bit slow. Though the characters grow to feel like good friends over the course of the book, Lucie’s transition from a floundering thirtysomething to an enlightened and well-rounded woman who knows what she wants from life is a lengthy one. Rather than a fun, quick read, this is a slow, transformative one, with just a bit of high-stakes action scattered throughout. The Sow’s Ear Café is an avidly inspiring and comforting story.